– The annual Prayers for Remembrance are about to take part for the 9th time. How and why did they come about in the first place? 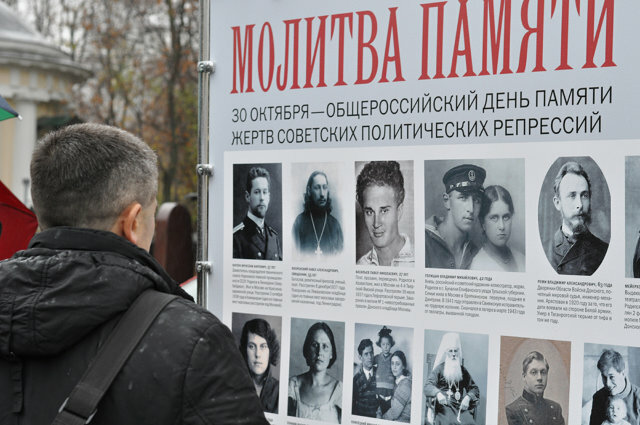 – The initial impulse came from Memorial’s event at the Solovetsky Stone – their “Returning of Names”, which takes place in Moscow but doesn’t happen in other cities. 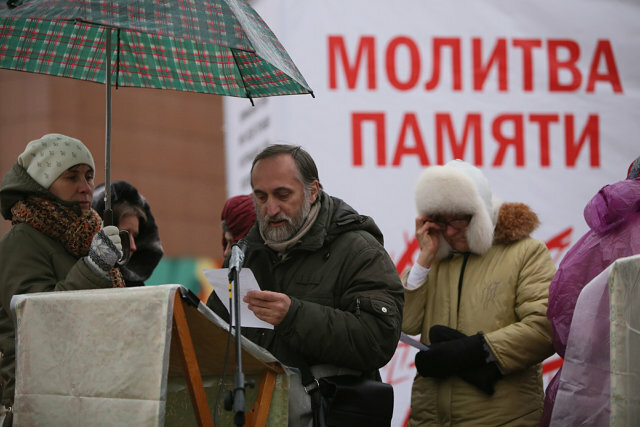 Seven years ago, the St. Peter’s Orthodox Brotherhood in St. Petersburg decided to do something similar in that city, and read out a list of names of the repressed. And, perhaps given the strength and particular attitude of that brotherhood, this reading of names was actually a spiritual event, a truly prayerful remembrance of those who were crushed by the 20th century. Literally the very next year, other cities also began to do something similar, and the initiative was changed and renewed a little bit in Moscow. 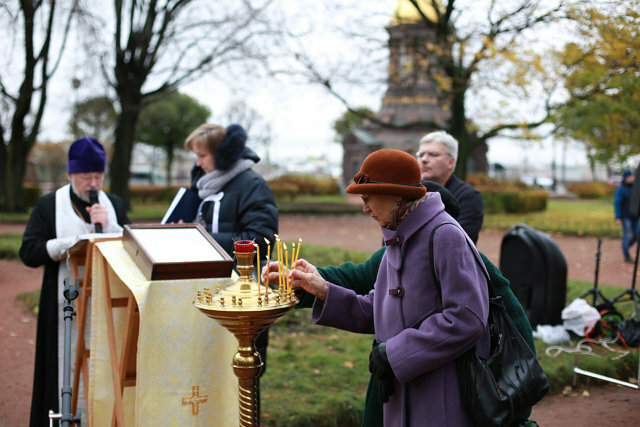 And the event, which in St. Petersburg is called by a line from Anna Akhmatova’s “Requiem”, “Would that we could call every one by name…”, received a general name across all of Russia, “Prayers for Remembrance”. We began to see that this reading of names really could be a prayer, i.e. an event which builds community and unites people. After all, we are living in strange times: on the one hand this is a time of great freedom – both on the level of societal consciousness and on the level of law – but on the other hand, any attempt to exercise one’s freedom nowadays is met with the question, “are you for the authorities or against them?” This is really strange, and one immediately wants to protest. Is not societal life more nuanced than the simplistic dualism implied by this question? 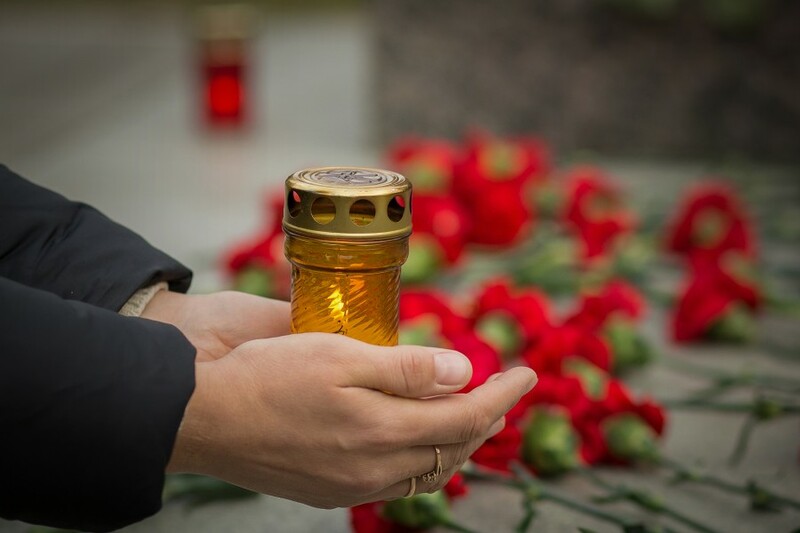 When we say that the Prayers for Remembrance are not a political event or movement, we are defending their original meaning: it is hoped that everyone who participates would think more broadly, remembering all family members and loved ones, beyond all the name-calling and slogans. Because the coup of 1917 and all that followed was not simply a political event, but an event in history and in human life, it didn’t just pose the question of what party we belong to, but asked us, point-blank, to clarify who we really are. And today, absolutely anyone can take part in the Prayers for Remembrance, without reference to their political or religious views. Yes, we pray a litany in the places where the event takes place, but we are also thankful to those who can’t find it within themselves to participate in the prayers but come simply to read out names. Because the human dimension of memory, the ability to sympathize and empathize, is more important than anything else here. – That is, you allow that a person might show up who believes, as in the past, in the correctness of the communist ideal, but regrets “various abuses and distortions”, for instance the mass terror of the 1930s? – Yes, and I’m ready to repeat again: Absolutely anyone can participant in the Prayers for Remembrance. And we remember any person whatsoever. Sometimes this puts us in a difficult position: how is it you are just reading out all the lists in order? You aren’t only returning the names of the victims, but of their executioners! We are in agreement that from a church point of view this is a question for discussion. But let’s be clear, it is extremely difficult to evaluate the events of the 20th century in Russia from a doctrinal position, and they remain – to this day – not fully understood at the level of the church and the Russian people in general; we don’t have the internal strength for this. For some reason, it seems intuitively clear to us that we shouldn’t be choosy in this matter, but remember each and all before the face of God, and it is God’s business to judge each one. We need to leave this to Him, and for this reason, of course we are open to everyone. Even if a person has basic pity for his clan, for his people – he’ll feel at home at the event on the 30th of October. We all live together, and it is of the utmost importance that we understand what that means. Some may like this fact, and it may be distasteful to others, but I live next door to my neighbor, no matter who he is. And that means he’s not completely “foreign” to me. – Let me clarify again: if it isn’t politics, or even faith that unites those who come together on the 30th of October to read the names of the repressed, than what is it that unites them? Is there some sort of value-name by which we can call the basis for participation in the event? – It isn’t always easy to name that which unites us. The most obvious answer is our memories: of relatives close to us or further from us, and even of those, about whom nothing is known, other than that they existed. When we look into the past and understand that it isn’t altogether foreign to us, we are united by the need for continuity. And at the extreme, looking into another person’s eyes, we are linked at our very depth, of course, by love. It’s the reason why people live at all, why they live together, and how they are able to feel bonds of kinship with each other. At least we would hope that the remembrance of names would be an act of love, and not some settling of scores or even a restoration of justice. A feeling of love toward each other is the very thing that the Soviet era destroyed and took away from us all in the first instance. In calling some people “enemies of the people”, the idea wasn’t at all to divide people according to political allegiance, but to show that some of us aren’t even people. And the right to determine which of the two of us is a person, and which isn’t, doesn’t even belong to the two of us ourselves, but to a third party – the vindictive eye of the state. The decisive measure or your relationship to another party becomes not your feelings toward him or her – whether mother, father, or neighbor – but the view of a third party. And to this day we look for that view, trying to understand who it is standing in front of us! This is some sort of a serious defect, an inability just to look another person in the eye…some sort of a need to take orders from elsewhere… We seriously have to get past this: we desperately need to “normalize” our societal consciousness. And if we really have to look for a third party, then at least let that third party be God himself, who is absolutely merciful, unifying, and ready to give his life for every one of us. – And at this point, how do you understand your relationship to the event run by the Memorial Fund? 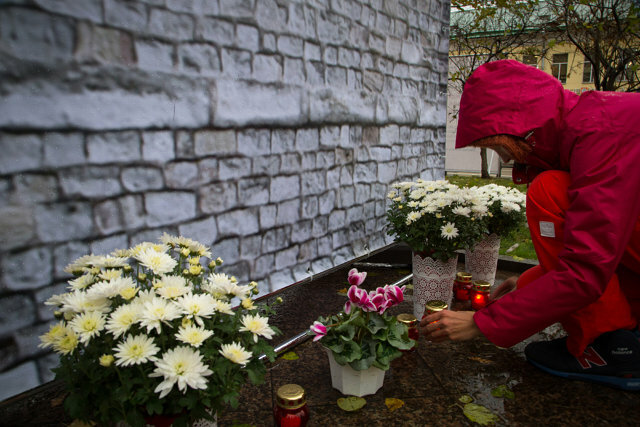 The Memorial event takes place at the Solovetsky Stone on the 29th of October, and yours, on the 30th. Is this a sort of passing of the baton of memory from one to the other, or a division between the two events? But having said that, each of the events unquestionably has its own personal flavor. One of our ideas, for instance, was to “complete and fulfil” the Return of Names with a more Christian view on the events of the 20th century. That’s what we are trying to speak about with you here in this interview. Any secular event, as we have already said, is evaluated at the political level, and we would like to heal that anomaly, which is an injury to societal consciousness, through love, compassion, and mercy. And another particularity of our Prayers for Remembrance is the desire to go out into the city, so that the wave of memory that converges around the Solovetsky Stone on the 29th of October should penetrate the whole of the space in which we live. In Moscow, we’ll read lists of names in dozens of streets and squares, the list of which is ever increasing and which, we, as ever, will agree with the mayor’s office. All the more, as our event takes place with the blessing of the Synodal Department for Church relations with society and the press. – So it turns out that the organization of these events lies primarily with the momentum of two groups – the Memorial Fund and the Transfiguration Brotherhood. Are there other organizations who are willing to share your work? – In terms of nationwide structures, perhaps not yet, and once again I repeat that this is a great pity. But locally we have a number of loyal partners. For instance in St. Petersburg a lot is done by the Anatoly Razumov Centre for Returned Names and the Anna Akhmatova museum, which provides our permanent location for the reading of names. Societies for the remembrance of political prisoners are also always very helpful. In each city, each year, we encounter a completely unique situation. – At present there is a lot of talk about the Church and service to society. Can the Prayers for Remembrance, which fulfil and complete the secular reading of names of the repressed, serve as an example of such service? – I haven’t spoken about this directly, but yes, I think the whole thing suggests this conclusion: this is a form, you might say, of social responsibility. You might begin with the fact that many of our deepest church thinkers and activists have not exonerated the Russian Orthodox Church when it comes to responsibility for the coup of 1917 and the events that followed, which lead to the ascendency within Russia of powers which were entirely alien to our history and tradition. Patriarch Kirill spoke about this upon the 100th anniversary of the Revolution. The church is also guilty for that catastrophe, perhaps not politically, but in some other way. But at the same time, it is within the church and at the very heart of church life that there is true medicine which would be healing for society. I am speaking of true mercy. The scale of the tragedy of 1917 was such, that to make sense of it politically, culturally and historically, just doesn’t work. Some sort of paradoxical action is needful here. We might say that taking a sober view of the fact that a great evil was committed in the 20th century, nevertheless our people will be united not by forgetting that evil but in the resurrection of its memory. But how could the remembrance of such injury ever be a uniting force? Only in one case: if the basis for such unity is mercy itself, rather than judgement. Mercy distinguishes good from evil, but mercy also sees the person at the heart of the conundrum. The field in which judgement is useful has its boundaries. And in the 20th century, with its show trials and denunciations, we went far beyond these boundaries. We have been injured by this experience of limitlessness and are unable to judge according to the law without destroying the one being judged. And it is for this reason that mercy, which is Christian in its very nature, is so badly needed. But of course our church has very little strength at present: we’ve let all our blood and are often infected with the same sort of competitive and fighting spirit that we see in the world. We’ll just have to do all we are able to do, even though we actually need to do much more. – Its fairly hard to understand what you are saying, if one isn’t a church person. The Transfiguration Brotherhood, continuing the general line begun with the Prayers for Remembrance, is also bringing together a Forum for Repentance and Rebirth – a group of people who are ready to unite around “resurrected memory”. And it seems that for the church it is clear why repentance and the resurrection of difficult memories leads to rebirth. But how does this mechanism work within a person who is far from Christianity? We are currently sitting at a very low level of society development, at which the levels of aggression and distrust are such that everything that binds people together today can easily become the basis for an argument tomorrow. Everyone feels that he is in the boxing ring, and that is difficult. How, ever, can we change this without admitting the problem to begin with? And how can we admit the problem if we don’t recognize that we aren’t normal and healthy? And how can we discover that we aren’t normal and healthy if we don’t think about the reasons for the abnormality? And how can we think about the reasons for the abnormality without remembering the 20th century? And how can we remember the 20th century without waking up our consciences? There is a very simple schematic for you, that lands us right at the front door repentance; at least, that is, if we are truly serious about rebirth – which is to say a new quality of life for our people. Any single person who makes the decision to think in this way becomes a “voice crying in the desert”, and in some way or another, changes the landscape of the desert in which we live. The comparison to a desert, here, is very appropriate; after all, today it is even difficult to say who the Russian people are, or who the people of modern Russia are. We are a mute people – without a voice. Important thoughts about repentance were uttered by our most worthy and virtuous in their time – whether Sakharov, Solzhenitsyn, or Averintsev. But who hears them? For whom are these people actually authorities? Who is willing to follow in their footsteps? In 1998, when the mortal remains of the Tsar’s family were interred, then President Boris Yeltsin made a strong statement about repentance. But for whom is he an authority? Finally, last year at the Wailing Wall, our current president had some very important words to share. But what difference did this make to the consciousness of our Russian people? It’s an open question. I need not even say that politicians often have to act upon differing motives and make pronouncements that profoundly disagree with each other – that’s the profession. But what are we ourselves doing? We can’t simply silence this question. And if we do silence it, then there is a high probability that we will simply cease to exist as a society that has a future. – I see that you have on the table before you a souvenir cup from Nuremberg and I’m thinking that many of us are still waiting for our “Russian Nuremberg”, that will judge all the events of the 20th century. Speaking of “the merciful judge”, it seems that you are hoping for something quite different…? – I don’t believe that the danger of Nuremberg has entirely past for Russia. We don’t remember that it wasn’t the Germans who opened the Nuremberg trials, but the powers that defeated Germany in the 2nd World War. And if something similar takes place in Russia – God forbid – here we will also be facing a court of “others”. It is sufficient to look in an intelligent way at what is taking place in Ukraine right now, in order to understand the cost, in terms of victims and schisms, of such a court. And we need to remember that real change in Germany was not brought about by Nuremberg, but by internal work involving that country’s memories – all those centers and societal initiatives, seriously concerned with problems of succession and responsibility. We, basically, have no such centers, and our problems are much bigger. The tragedy of Russia in the 20th century – in terms of time, space, territory and numbers of people – is absolutely unprecedented. Simply speaking, history knows no examples of successful withdrawal from a catastrophe of this size. The collapse of the Russian Empire in 1917 is comparable to the fall of Rome or Byzantium, but no recipes for recovery are available from either of those two camps. We have to come up with something homegrown. This is an impossibly creative task! With our Prayers for Remembrance, we are trying to set the tone for that task, you might say. – If you’ll allow me, I’d like to ask again about the “merciful court”. It’s easy to confuse this with what we might call “reconciliation without repentance”…calling everyone to live as friends, despite what has taken place. That’s not quite the same thing, is it? Rather, you probably mean a situation in which the guilt of all is shared by everyone? Initiatives to recover one’s family history pay off in droves here: and it’s necessary not only to remember one’s relatives, but to try to think through what they were up to during the Soviet period. We love our fathers and grandfathers and consider them to be good people. But how did it come to be that one set of good people lived through it all, and another didn’t make it? How did it come to be that one set of good people sat in concentration camps in the GULAG and another set of good people sent them there? How can that actually take place inside one nation? I understand that thinking about this is hard. Moreover, there are pressures to artificially restrict this sort of thought, as many important archives are kept closed up until this very day. But work on our memories is going forward in any case, and in order to be strong enough to endure this work, it is necessary to be internally certain that God never intended man to have any view other than a merciful one. Justice, in this case, is a principle without any effective force. If we take only justice as our basis, we will only start a massacre. In our brotherhood, there are people who still revere Lenin and just can’t believe that he wasn’t simply the kindly old grandfather figure they read about in Soviet books. This is understandable; it’s a natural human reaction. But what should we do about it? How do we get people to take on the idea that in the 20th century the primary imperial power ruling our own nation was terror? How do we take on the thought that we lived with thugs, rapists and repressors, and ourselves acted wantonly for 70 years? The problem of living through the experience of the 20th century is a problem of national scale. Generally speaking, all those noisy exhibitions, such as “Russia – My History”, where there is a mix of good and bad and various other concepts with which an honest person finds it hard to agree, are actually a very good sign in their own way. They bear witness to the fact that “stitching up” our memories is a sharply felt need within society – that society feels the need for resolution. A lot depends on what sort of resolution the future holds: from the teaching of humanities subjects in schools to the recognition of Russia in the international arena. At present, there is no one who can say that he knows an answer to our conundrum which would be right, once and for all. This is all the more true, given the current deficit of authority figures in our society. And no one knows how much time we’ll need to come up with a solution. Solzhenitsyn, as we remember, spoke of a hundred years; well, 30 have already passed. And we find ourselves in a less than simple position. Some find it hard to stand, some people emigrate, some try to live here, but as if they are living in Europe or America and can calmly mow their lawns without asking difficult questions. But whatever you might say, we aren’t in Europe or America. We live here, and for that reason it is pretty important that we do “come to”, and recover consciousness. – Participation in the Prayers for Remembrance can be a first step in “coming to” and recovering consciousness, but one question: what does a person do after that? How are we to live such a way that the Forum for Repentance and Rebirth comes to mind not just on one day of the year, but is reflected in our behaviour, relationships with those around us, and in our other actions? – This is, in all likelihood, a key question, and I can’t say that I have a ready-made answer. What does it mean to live “normally”, when all our ideas of normal have long since been spoiled? One thing I think is certainly true: the main task for each day should be to reveal the path from repentance to rebirth to those around us. We should do all we can to prevent 20th century history, the crimes of the 20th century and the possibility of overcoming them, from remaining a taboo subject. We need to speak with each other. On Pokrovka ulitsa in Moscow, close to Kitay Gorod, there is a building on which, even before the start of the “Poslednii Adres” (Final Address) Project, there was a notice which read, “1917-1953: Everyone who lived in this building left and never came back.” Such things simply don’t happen without cause – probably before that notice was put up people talked, then thought about taking some action and, in the end, the residents came to a common view and took action. 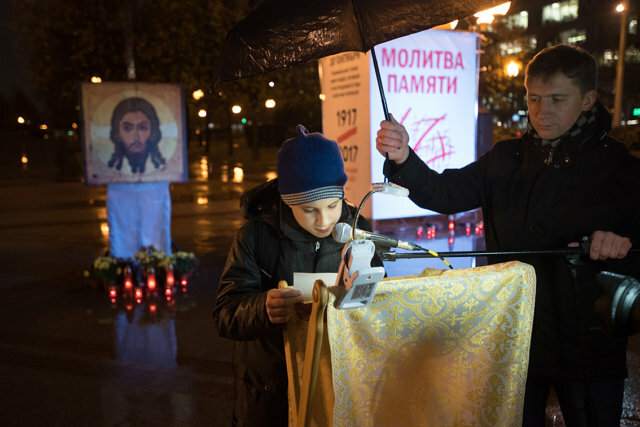 If the topic of repentance and rebirth becomes common currency, then monuments not only to war heros from WWII, but also to victims of the repression will become common. A wonderful principle that we have inherited from Sergei Averintsev, states that you should battle evil peacefully, but without ever giving in. It is in this spirit that we should speak with our family and loved ones about the ideas of the Forum and Prayers for Remembrance. If live people join our numbers, there will be more events like the Prayers for Repentance. Life will change and become more virtuous. To me, it is entirely obvious that a person who joins the Forum is already unable to sign a denunciation – never. He can’t complain about life without having a go at changing it, can’t just cast off those close to him, can’t, in the end, not know his neighbours or not try to be good willed toward all… And we must remember the most important thing, of course – a person who has “come to himself” is able to give to others those advances of love for which our society has waited for so many years, and will inevitably continue to wait for.